This blog or ‘online magazine’ as some have described it is growing which is nice, it doesn’t really matter mind you as it’s primary purpose is to ‘keep me off the streets at night’. Its secondary purpose is to teach an ‘old dog’ a few new tricks about the digital world in which we all live. I’ve learned a lot frigging round with the thing which i have applied in my day job! Funny thing is I thought the readers would be Australian given the ‘core content’ but most of you, 92% to be precise are from countries yonder. Great! It’s global this internet thingy. Regulars will have worked out the content is eclectic, which is partially a reflection of my automotive tastes and also down to ‘a photo spotted’ driving topic choice. No great logic, just the way it is! It’s not an interactive forum mind you, Facebook is. I’m on FB, in fact my journey to the blog was via FB which is good but has it’s limitations in terms of exploring things in depth. With the blog I am not hindered by word limits, some of the articles are ‘epic’ in size if not quality. So check me out on FB. 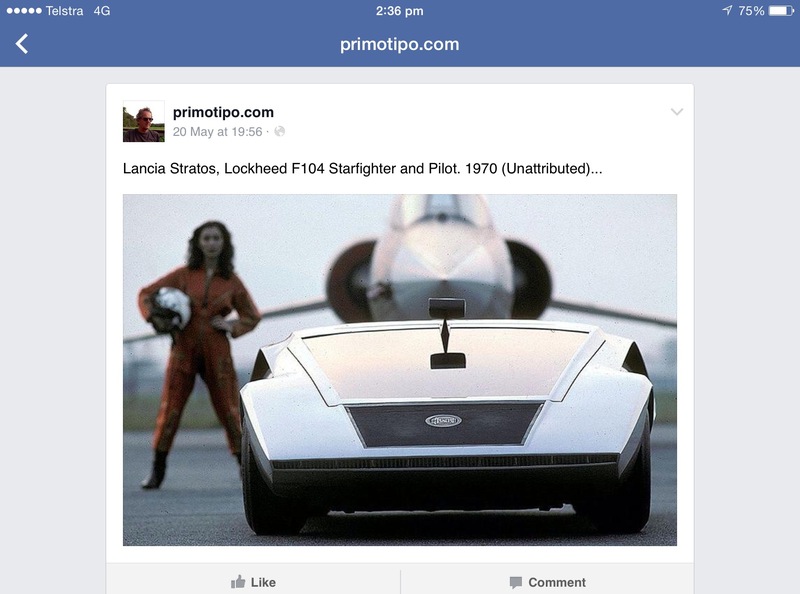 Key primotipo.com into the FB search engine, ‘like me’ and you will get the stuff I upload, which is every day or so, many of you already do. Suss the motorsport groups on FB for the interactivity they offer; key into the FB search engine your car or form of racing of choice, i guarantee you will find a global group of like minded enthusiasts. In fact the whole thing for me started with one of my first subjects, ex-Australian International Racer Buzz Buzaglo ‘friending me’ into a couple of FB groups he was in. The ‘Tasman Racing Cars’, ‘F5000 Australia’ and ‘F5000 Racing Cars’ groups for example have many ex-mechanics, engineers and drivers loitering with intent to correct the ‘i reckons’ of fellow enthusiasts which is great, its content rich. 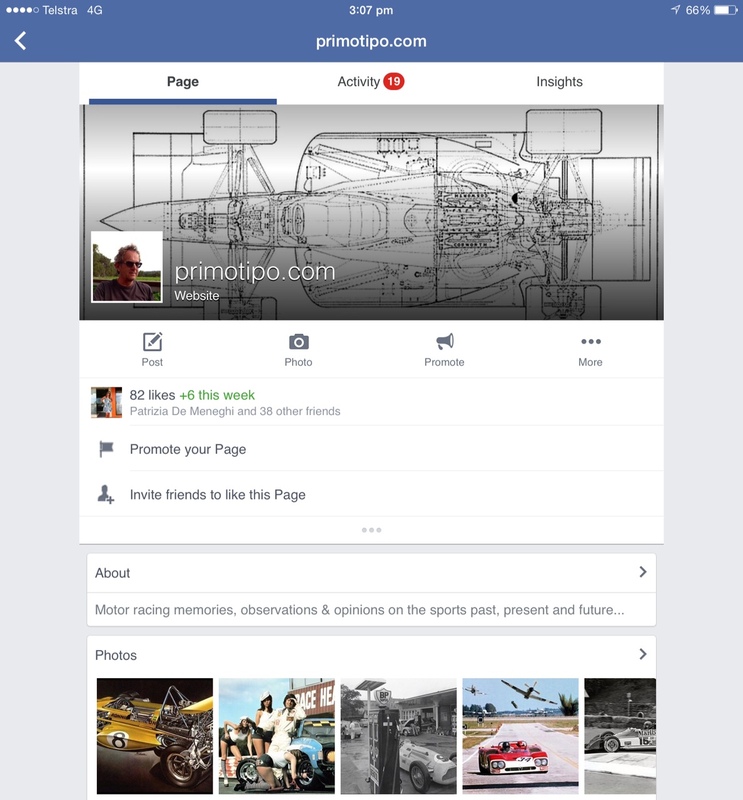 I’m on Instagram too, but if you follow primo on FB you’ve got it covered, Instagram would be a double up really. Hard to keep up with it all ‘innit- Facebook, Instagram, Twitter, Tumblr, plus the online forums each of us like, not to forget good ole text messages via Snapchat, WhatsApp, and Skype has it’s place too. And emails. Bizarre really. Mark you do a great job with the FB page and here, on the Blog, there is always something interesting or different! The people I have shared the Blog with have loved it! Keep up the good work! One of these days I will be in Melbourne and hold you to the drink! It is a bit of fun and a great way to meet a swag of interesting people, look forward to the beer when you are in town! Ha! LOL etc, and thanks, WordPress tells me it was 3 years yesterday since I first registered the website. I’ve learned a lot about a whole lot of areas of motor racing I knew nothing about, it’s funny really, when it started I thought I would gravitate to the familiar, but mainly that’s not been the case. Appreciate your interest and ‘sub-editing’ role!